Product prices and availability are accurate as of 2019-04-16 00:07:17 UTC and are subject to change. Any price and availability information displayed on http://www.amazon.com/ at the time of purchase will apply to the purchase of this product. This master keyed ANSI Grade 2 certified, heavy duty, ball knob entry lockset is part of our Legend Contractor Series commercial duty line, designed for use in high quality residential and medium to light duty commercial buildings. 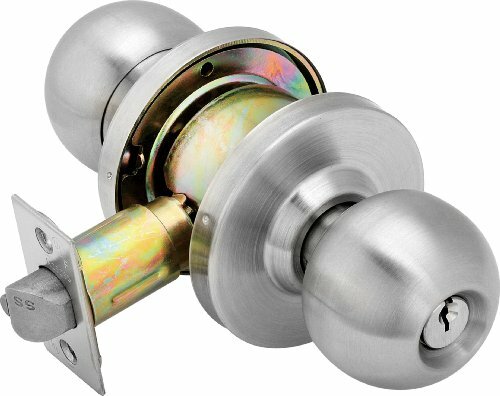 Our Contractor Series features a 1/2-Inch throw latch bolt and is UL listed. These locksets are known for their strength, can withstand heavy usage and are easily installed. The cylindrical housing and interior parts are made of heavy gauge cold rolled steel, zinc plated and dichromatic for rust resistance. The threaded outside rose adjusts for doors 1-3/8-Inch to 2-Inch, while an inside rose ensures there are no exposed screws. The combination wood/metal screws accommodate both wood and metal doors. With a solid brass 6 pin tumbler cylinder and 2-3/4-Inch UL listed backset, you know the quality is great. Includes 2 SC1 keys and is master keyed for Series P. The excellent craftsmanship is backed by Legend's Lifetime Mechanical Warranty and a 10 year warranty on the US26D stainless steel finish.